South End Press, 9780896087293, 300pp. Vibrant. Strong. Fierce. 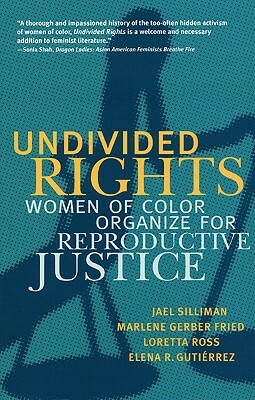 "Undivided Rights" captures the evolving and largely unknown activist history of women of color organizing for reproductive justice--on their own behalf. "Undivided Rights" presents a fresh and textured understanding of the reproductive rights movement by placing the experiences, priorities, and activism of women of color in the foreground. Using historical research, original organizational case studies, and personal interviews, the authors illuminate how women of color have led the fight to control their own bodies and reproductive destinies. "Undivided Rights" shows how women of color---starting within their own Latina, African American, Native American, and Asian American communities--have resisted coercion of their reproductive abilities. Projected against the backdrop of the mainstream pro-choice movement and radical right agendas, these dynamic case studies feature the groundbreaking work being done by health and reproductive rights organizations led by women-of-color. The book details how and why these women have defined and implemented expansive reproductive health agendas that reject legalistic remedies and seek instead to address the wider needs of their communities. It stresses the urgency for innovative strategies that push beyond the traditional base and goals of the mainstream pro-choice movement--strategies that are broadly inclusive while being specific, strategies that speak to all women by speaking to each woman. While the authors raise tough questions about inclusion, identity politics, and the future of women's organizing, they also offer a way out of the limiting focus on "choice." "Undivided Rights" articulates a holistic vision for reproductive freedom. It refuses to allow our human rights to be divvied up and parceled out into isolated boxes that people are then forced to pick and choose among. A founding member of SisterSong, Loretta Ross became National Coordinator in 2005. In 2004, she was national co-director of the April 25, 2004 March for Women's Lives in Washington DC, the largest protest march in US history with more than 1 million participants. Ross has a twenty-five-year history of involvement in feminist movements--both in ending violence against women and promoting reproductive justice--in the US and internationally. She was active in the black nationalist and civil rights movements, conducting research on the far right and anti-abortion violence. Currently at work on a book entitled "Black Abortion," she has written extensively on African American women and abortion, and has organized many events for women of color in the reproductive justice movement. Currently, she focuses on the human rights movement and is the founder and executive director of the National Center for Human Rights Education. Elena Gutierrez is an associate professor in gender and women's studies and Latin American and Latino Studies at the University of Illinois, Chicago. Dr. Gutierrez earned her PhD in sociology from the University of Michigan in 1999 and is a scholar of Latina/o reproductive and sexual health politics, feminism and social activism, and Chicana/o studies. She has recently received funding from the Migration and Health Research Program (PIMSA) for a collaborative, bi-national project to research the role of social networks in the reproductive health care that Mexican immigrant women in Chicago. She is also the principal investigator of the Sterilization Policy Project, which assess the current status of female sterilization informed consent protocols across the nation. Her book publications include "Undivided Rights: Women of Color Organize for Reproductive Justice" with Jael Silliman, Marlene Gerber Fried, and Loretta Ross (Boston: South End Press, October 2004), which received the 2005 Gustavus Myers Outstanding Book Award, and "Fertile Matters: The Politics of Mexican Origin Women's Reproduction" (University of Texas Press, 2008). "Fertile Matters" documents the involuntary sterilization of Mexican-origin women in Los Angeles in the 1970s and illuminates the ways in which political, social, and racial anxieties shaped the construction of the "problem" of Mexican origin women's fertility and reproduction. Dr. Gutierrez has served on the boards of and worked as a consultant with the National Latina Health Organization, SisterSong Women of Color Reproductive Health Collective, the National Latina Institute for Reproductive Health, and Mujeres Latinas en Accion. Marlene Gerber Fried came to reproductive justice after her involvement in the civil rights, women's liberation, and anti-war movements of the 1960s. Since the late 1970s, her focus has been domestic and international abortion and reproductive rights. She works with student activists in her role as director of the Civil Liberties and Public Policy Program at Hampshire College, where she is also a professor of philosophy. Marlene is the founding president of the National Network of Abortion Funds, a co-founder and board member of the Abortion Access Project, and serves on the international board of the Women's Global Network for Reproductive Rights. She edited "From Abortion to Reproductive Freedom: Transforming a Movement." Jael Silliman has been an activist both in the US and international women's health and reproductive justice movements. She was a program officer at the Jessie Smith Noyes Foundation, an early supporter of organizations of women of color. She was an associate professor of women's studies at the University of Iowa, where she wrote about social movements, women's health, and reproductive rights. Currently an independent consultant, for six years she was the program officer for reproductive rights in the Human Rights Unit at the Ford Foundation. Her other books include "Policing the National Body: Race, Gender, and Criminalization, " co-edited with Anannya Bhattacharjee, and "Jewish Portraits, Indian Frames: Women's Narratives from a Diaspora of Hope." She is from India and is an immigrant to the US.